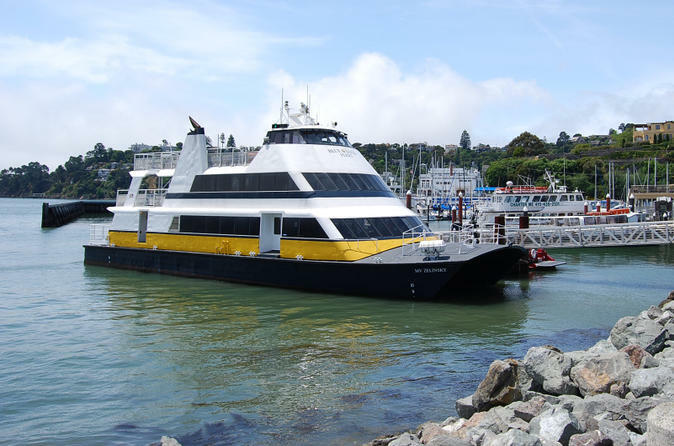 Hop aboard the ferry for a trip from San Francisco to Sausalito or Tiburon. This one-way or round-trip ferry service takes you across San Francisco Bay with beautiful views of the city skyline, Bay Bridge and Golden Gate Bridge. In the charming bayside city of Sausalito or Tiburon, explore narrow streets filled with boutiques, galleries and museums at your leisure, and enjoy a meal (own expense) at a waterfront restaurant offering unbeatable views of the surrounding Bay Area. This is a great way to maximize your stay in San Francisco, and makes for a romantic getaway or a fun day trip with family and friends. From Fisherman’s Wharf in San Francisco, board a ferry and relax on the ride along San Francisco Bay to your choice of Sausalito or Tiburon. Along the way, enjoy views of the Bay Bridge, Alcatraz and the iconic Golden Gate Bridge. This comfortable vessel features several amenities for your comfort and convenience, and drinks and snacks are available for purchase on board. After exploring Sausalito or Tiburon at your own leisure and expense, choose from multiple ferry departure times to return to San Francisco. SausalitoThis quaint, charming bayside city tucked among the Marin County hills features a variety of art galleries, boutiques, specialty shops and fine dining. You’ll be greeted by the Elephant Light Standards, a pair of concrete elephants flanking the entrance to Vina Del Mar Park which have come to be a symbol of Sausalito. Take time to meander through the narrow streets at your own pace and enjoy views of the San Francisco skyline. Check out the Bay Model Visitor Center, visit the Bay Area Discovery Museum, rent a kayak, go hiking or biking, or tour the houseboats and marinas. TiburonOriginally named Punta de Tiburon (Point of Sharks) by Spanish explorers in the 1800s, this historic railroad town feels like a quaint, romantic New England fishing village with a modern flair. Tiburon’s classic, chic Main Street offers a slew of galleries and antique, wine and specialty shops. Bring your bike for a leisurely tour of the shoreline paths or challenge yourself to a hike up Mt Tamalpais. Enjoy a lovely meal (own expense) at a casual outdoor café or high-end waterfront restaurant offering spectacular views of San Francisco. Check out the Railroad Ferry Museum, visit Old St Hilary’s – a restored Gothic church overlooking the bay – or explore the Tiburon Uplands Nature Preserve or Richardson Bay Audubon Center and Sanctuary.